Money Dunidle is an idle RPG dungeon crawler game with 2d pixel graphic style. Collect gold, upgrade and build your team up with the most powerful heroes. Loot enchanted magical legendary weapons from legendary chest to fight against monsters from different dungeons and the most epic bosses. Download now and enter the world of Dunidle!! 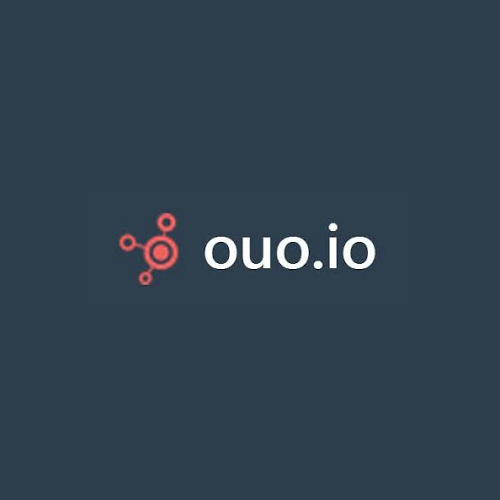 • Idle and offline RPG gameplay with 2D pixel style. • Crawl through endless and random dungeons. • Fight against many different types of monsters and epic bosses. 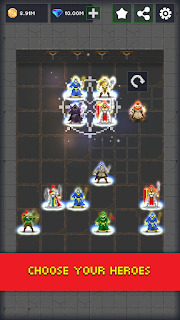 • Upgrade and manage your party with many different choices of tactic. • Collect gold, unlock and upgrade the most powerful heroes: Knight, Thief, Priest, Archer, Wizard, Barbarian, Druid, Paladin, Templar and Necromancer. • Loot equipments from mysterious and legendary chests to discover enchanted or legendary new unique weapons. • Discover Many different weapons: sword, dagger, bow, staff, mace, spear etc. 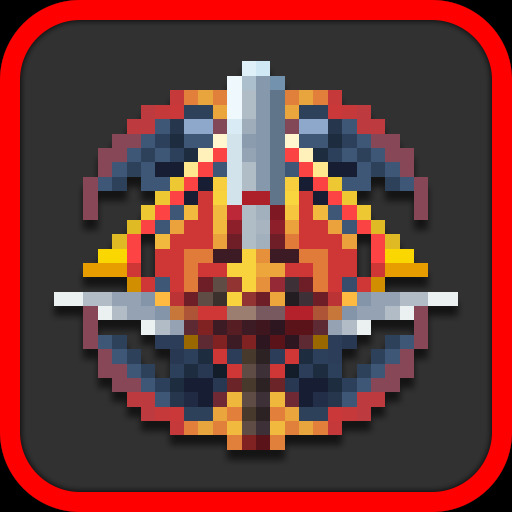 • Collect the most powerful artifacts from epic bosses. Knight is the bravest hero. He is not afraid of any monsters or bosses, with his sword he can attack defeat all of them. His strength can lead the team to a victory. Thief is the most speedy hero. His combat with powerful daggers can attack on any monsters and bosses with deadly damage. Priest is a guardian of the team. He can recover his team’s health and prevent his team from any dangerous attack of monsters and bosses. Archer is a sniper of the team. His powerful long range attack can shoot any monsters and bosses no matter how strong they are. 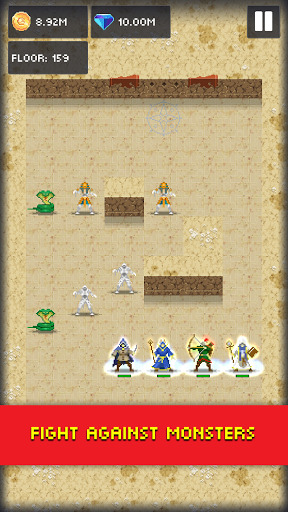 Wizard is the most powerful magical heroes of the team. 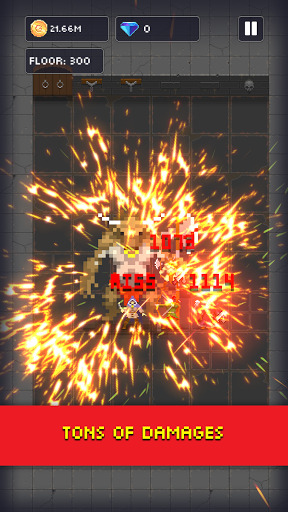 He uses his magic arcane power for enhance his attack damage. No any monsters and bosses can fight against him. Barbarian is a hero who is driven with his anger. Whenever he is angry, his attack is becoming very powerful. All of monsters and bosses will be afraid when he is angry. Druid is summoner hero. His magic can summon the most powerful creature to crush all monsters and bosses. Paladin is a defender of the team. Monsters and bosses will receive more damages from his support ability. Templar is a defensive character of the team. Any damage from monsters and bosses will be prevented from hurting his team by his shield. 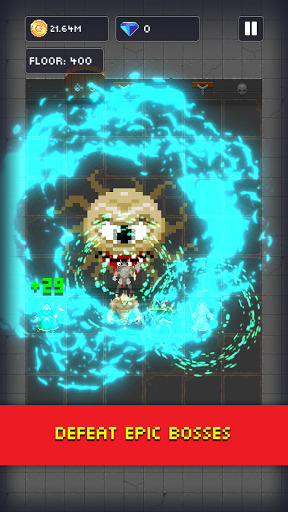 Necromancer is most mysterious yet powerful of the team. He draws souls from dead monsters. Each souls can build his damage up and improve his curse which can weaken enemies strength.